A post I’ve been meaning to do for a while – as I enjoy delivering workshops with parents for e-safety. There is lots of support for schools in delivering the e-safety curriculum – I look at this here, however, many parents can be confused by the advice, and schools can be a great ‘first port of call’ for any concerns. Make your advice on e-safety as clear as possible – and share this with parents. Coffee mornings, evenings, parents invited to assemblies even events led by your Pupil Digital Leaders. I have even share You Tube Clips of some of Playstation / X Box Games with parents so they can see what they look like! 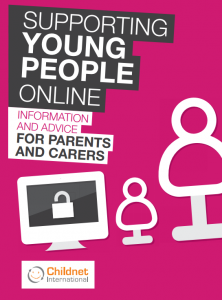 A web page with information for parents is also crucial – and share links on there as well. I also think that it may be necessary to spend time actually looking at what devices children have at home – and what you can do to make sure they are safe. Remember appropiate training for staff, governors and parents should be at least an annual event! I can throughly recommend the Esafety Adviser Site for helpful ideas, and training. Make sure you know what devices connect to the internet and how. Set boundaries! Be clear about how long they can be online and what they can do online. Don’t forget though: Encourage your child to go online and explore! There is a wealth of age-appropriate sites online for your children. Encourage them to use sites which are fun, educational and that will help them to develop online skills. They can have a play at this site. Get Safer Online also covers many aspects on online security such as online banking, identity theft and keeping children safe. There is a great Digital Parenting guide from Vodafone here – this contains details of setting up mobile phones with parental controls and how to use safety modes on other apps and services. Reminding parents of the nature of Social Networking sites – a great childine leaflet can be downloaded here. If you have a child who is due to start Secondary School find more information here. Remember – Internet Service Providers (such as Virgin, BT, Sky and PlusNet) all have parental controls which you need to ‘switch on’ – just contact your provider, or take a look at these videos here. Posted by RS on June 2, 2014 in Supporting Parents, Teaching and Learning and tagged esafety, Parents.